The tiny Chapel of St Edmund on Priory Road, once referred to as the Chapel of St John (see below), has had a chequered history. 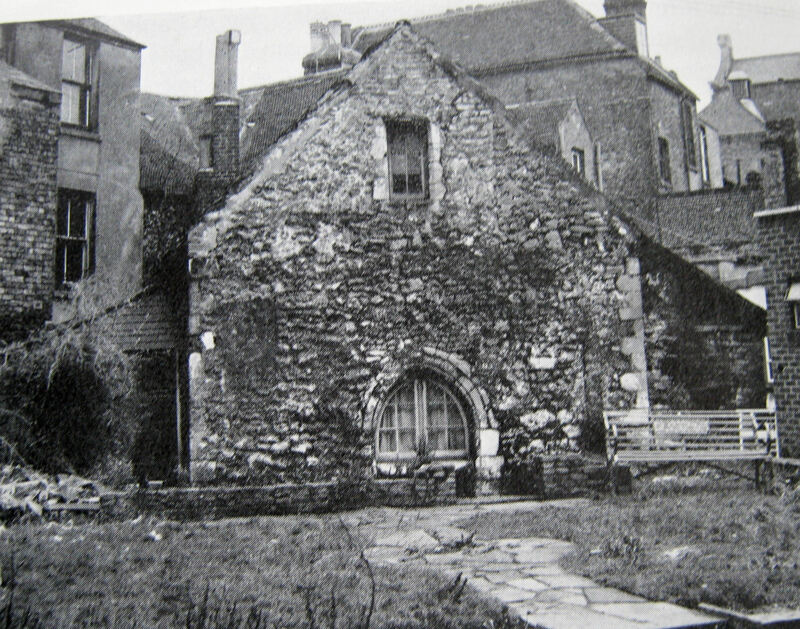 It is believed that a ‘Cemetery of the Poor’ was established in 1131 by the Priory of St Martin’s on ground between the Priory (now Dover College) and the Maison Dieu. The latter administered to pilgrims going to and from Canterbury Cathedral where there was a shrine to Thomas Becket Archbishop of Canterbury (1162-1170). Many of the pilgrims were sick and those who died and had no money were buried in the poor peoples’ cemetery. Facing the monastery walls the cemetery had a small chapel. In March 1253, Richard de la Wyche (1197-1253), Bishop of Chichester, well known and respected for his strict life style, came to Dover. He had been raising funds for the Seventh Crusade (1248-1254) on behalf of the Pope Innocent IV (1243-1254) but the constant travelling was taking its toll. While staying at the Maison Dieu the Master – Michael de Kenebalton – asked the Bishop to consecrate the rebuilt poor people’s cemetery chapel in honour of St Edmund of Abingdon. When Bishop Richard first went up to Oxford, St Edmund had been his tutor and later joined him when he went to Rome. Following St Edmund’s death Richard trained for the priesthood for which he studied theology for two years with the Dominicans at Orléans, France. born in Abingdon. Educated at Oxford University, he later taught logic (1219-1226). Having gained fame as a preacher in England and France, about 1227 he was commissioned by the Pope Gregory IX (1227-1241) to preach on the Sixth Crusade (1228-1229) throughout England. In 1234, at the instance of Pope Gregory IX, Edmund was appointed Archbishop of Canterbury and in this capacity he instituted reforms in courts and monasteries and among the clergy. However, in doing so the Archbishop fell foul of both the King Henry III (1216-1272) and Pope Gregory. When the Pope ordered that 300 English benefices to be assigned to Romans, the Archbishop set out for Rome to plead against this. Richard travelled with him but when they arrived at the Abbey of Pontigny, France, the Archbishop became sick and they decided to return to England. Sadly, a few days later, on 20 November 1240, he died and his body was taken back to the Abbey. There the Archbishop was buried and was canonised in 1246. The dedication ceremony of the Chapel took place on Refreshment Sunday, 30 March 1253, but the next day Bishop Richard was taken ill and on the night of 3 April he died in the Maison Dieu. Before the Bishop’s body was returned to Chichester Cathedral for burial, his internal organs were removed, put in a leather pouch and buried in a Cist – a religious pit – under the Chapel’s altar. On 22 January 1262 Bishop Richard was canonised. A carving of him by the late Bob Forsyth can be seen in the Maison Dieu. As St Edmund’s chapel was the only church in England dedicated to one English Saint by another it quickly became a place of pilgrimage. 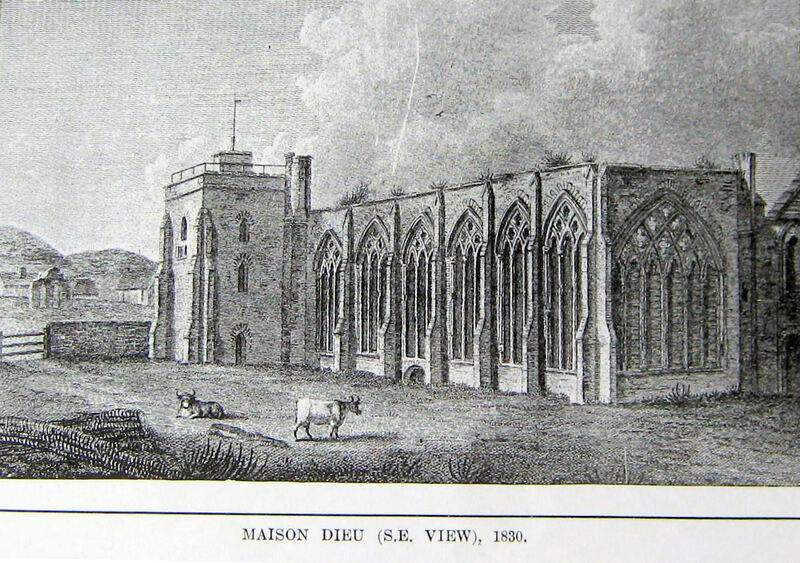 During the Reformation (1529-1536), the Chapel, Maison Dieu and the Priory of St Martin’s were surrendered to the Henry VIII (1509-1547). The Wellard family, who were of considerable importance in Dover at this and for some time after, built their mansion on the site of the Chapel incorporating it into their dwelling. Reverend John Lyon described this in his two volumes History of Dover published in 1813. In the years that followed the mansion was demolished but the Chapel remained and was incorporated into buildings facing Biggin Street. The site of the old Priory became Priory Farm and was bounded by a stone wall, probable the original one that also went around the Chapel’s small cemetery. It is reported that there was a small gate in the corner of this wall, approximately where the Prince Albert pub now stands. This opened onto to a path that led to the front of the Priory Farm. Priory Road was laid in 1872 by which time Fred Turtle, a whitesmith, plumber and electrician, was using the Chapel as a workshop. Three years later, in 1875, the floor of the adjoining Comet Inn collapsed and to everyone’s surprise, in the debris were coffins! These roused a great deal of interest and local historian, Rev. S.P. Stretham, made the connection with the Chapel and wrote a description of it. He said that the Chapel was still incorporated in the surrounding buildings and described it as small – 28 feet long (8.5 metres) and 14 feet broad (4.26metres) with walls ‘which are fairly intact.’ These are, he wrote, ‘2 foot thick (0.6 metres) and built of rubble masonry with Caen stone quoins and dressings.’ Reverend Stretham conjectured that the Chapel belonged to the Priory, the Maison Dieu or the Hospital of St Bartholomew in Buckland. 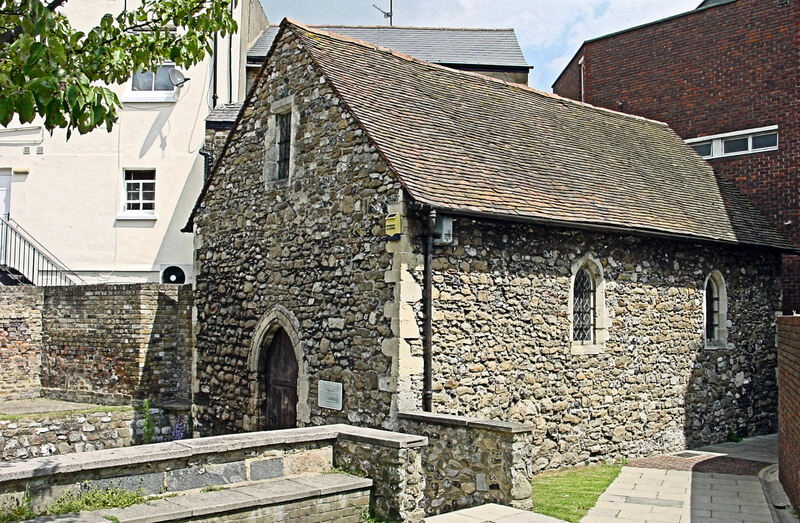 However, the Reverend’s speculation was dismissed and it was generally agreed, on the evidence available, that the building was a wayside chapel and dedicated to St John. It wasn’t until 1932 that anyone dared to contradict the, by then, accepted theory but in that year local historian, W J Baker, suggested that it was possibly the Chapel consecrated by St Richard of Abingdon in honour of St Edmund in 1253. In January 1935, during the relaying of Priory Road, F M Downey of Oxford University came to Dover examined the building carefully and confirmed Mr Baker’s opinion. 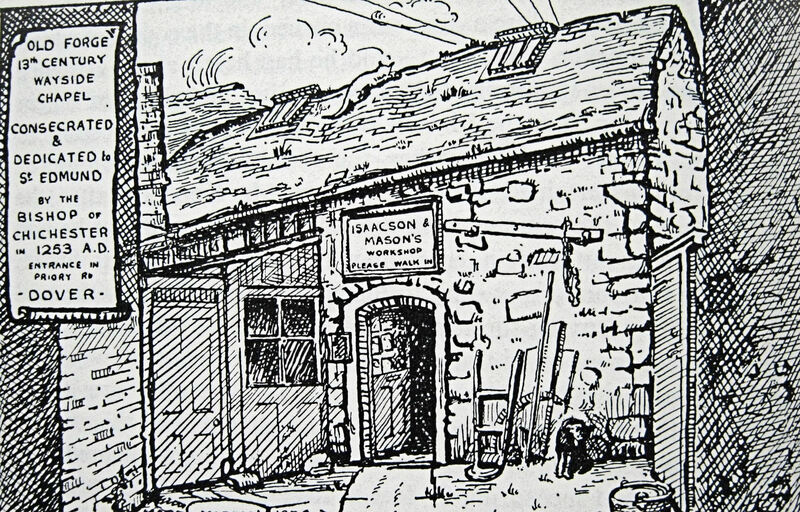 At the time Isaacson & Mason were using the building as a forge and Mabel Martin captured this in a drawing in 1939. Later that year, on 3 September, World War II (1939-1945) was declared. On 24 August 1943, during heavy shelling, Bricknell’s newsagents and tobacconist shop in Priory Road was wrecked. When the ruins were cleared, St Edmund’s Chapel was seen unattached to surrounding buildings for the first time in four hundred years! For many in Dover this was seen as a message from God and revered. Indeed in 1944, following a request from the Reverend Stanley Cooper, vicar of St Mary’s Church, Borough Engineer, Philip Marchant, proposed to restore the Chapel as a war memorial. With this in mind it became a major feature of the proposed post-war Abercrombie Plan for the future development of the town. Much to those who cared surprise, in 1953, the Ministry of Works stated that St Edmunds Chapel was not an ancient monument and its preservation could not be described as of national importance. At the time the Chapel was occupied by the Buckland branch of Toc H – the international Christian Charity movement – who had undertaken some restoration before refurbishing the Chapel as a workshop. There they made and repaired toys as Christmas presents for poor and sick children, assisted by lads from the Borstal on Western Heights. Among other charitable deeds, Toc-H collected and chopped wood to give to the elderly poor of the town who had open fires. Throughout Toc-H’s tenure moves were made to have Downey and Baker’s views, that the building was of historic significance recognised, and for the building to be listed as an Ancient Monument. Albeit, at that time although much of old Dover that was still standing following the War, was succumbing to demolition and replaced by concrete and glass in the name of progress. In 1963, the Chapel was designated for demolition along with the adjacent buildings. Father Terence Tanner, Parish Priest of St. Paul’s Roman Catholic Church responded by launching an appeal to buy all the properties. Patron of the appeal was former Prime Minister – Harold Macmillan but two years later, the appeal was still £1000 short of the £12,000 needed. Dover Corporation gave £100 and KCC another £100 and then an anonymous donor gave £2,000 and the Chapel was saved and could be refurbished! On 16 November 1966, restoration began under the auspices of historic buildings architect and consultant, Anthony Swaine of Canterbury. The work was carried out between 1966 and 1968 by local craftsmen and local contractor Barwick’s, using only genuine medieval materials. The flagstones came from Faversham Abbey in Kent (1152-1160). The main part of the altar was built from recovered stone of Bell Harry tower of Canterbury Cathedral, (1475-1507). The ‘Mensa’ Stone (the top stone) of the altar is pre-reformation and was found in a farmyard adjoining the church of St. Clement in Old Romney, Kent. The two central tie-beams came from a barn on the Barham Downs at Elden, Kent. The east beam is original but it would appear that there was never a west beam. The roof is considered a fine and remarkable example of 13th Century construction and there is still a number of its original tenon joint securing pegs in place. The floor area in front of the altar was probably laid in the 14th century and has since remained undisturbed. 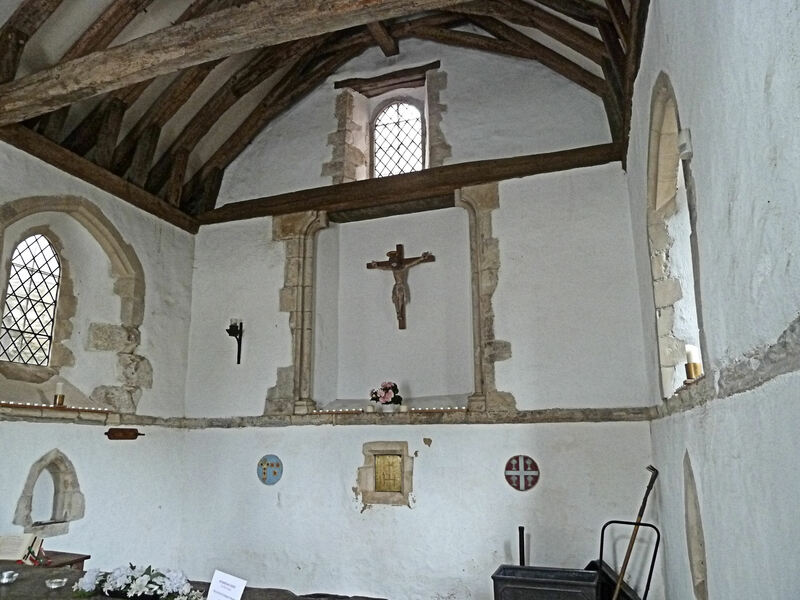 The Crucifix on the east wall, is a contemporary carving in the style of the 13th century by Bob Forsyth. A small relic of St. Edmund in the south wall niche was donated by the Abbey of Pontigny, France, where St. Edmund’s shrine still stands today. During the restoration, the Kent Archaeological Research Unit (KARU) under Brian Philp conducted a 4-day archaeological investigation. They removed nearly a metre depth of ‘soil‘ to get back to the ground level of the 13th century. The archaeologists dated the walls between 1150 and 1253 and the foundations of boundary wall after 1253. While they were excavating they came across a nearly vertical tubular impression in the soil. This was the impression left by a wooden stake, since rotted away, that had been driven into the ground to the Cist and the leather bag that contained the Saint’s entrails. The stake enabled pilgrims to ‘touch’ the relic of St Richard and, it was reported, miracles were performed. The Cist is now empty but can still be seen. The finished Chapel was presented, as it would have looked in the thirteenth century and therefore, there are neither pews nor fabric hangings. The Chapel dedicated to St Edmund was re-consecrated on 27 May 1968 by Archbishop Cowderoy of Southwark. In attendance was the Mayor of Abingdon, Leslie Steggles – an old boy of Dover Boys’ Grammar School. Following the consecration part of the bone of St Edmund enshrined in a gold reliquary was given to the Chapel by the Bishop of Limoges. This was stolen in July 1973 but within days two local boys were arrested and the casket was returned. On 5 November that year the St Edmund of Abingdon Memorial Trust was set up to maintain the building. In recognition of Father Tanner’s endeavours, a memorial plaque is mounted in the Chapel and his ashes are interred close to the altar. There is a narrow passageway – St Edmund’s Walk, from Biggin Street to Priory Road that runs past the Chapel. Civic Trust was founded in 1957 and established their award scheme two years later. The Awards recognised the very best in architecture, design, planning, landscape and public art and in 1969 the Restoration of St Edmund’s Chapel won an award. Unfortunately, the judges had been told that Dover Corporation’s borough engineer, David Bevan, had initiated the restoration and he was given the prize. To give Mr Bevan his due, he did inform the Civic Trust that it was Reverend Terence Tanner who was responsible. Civic Trust went into administration in 2009 due to a shortage of funding. 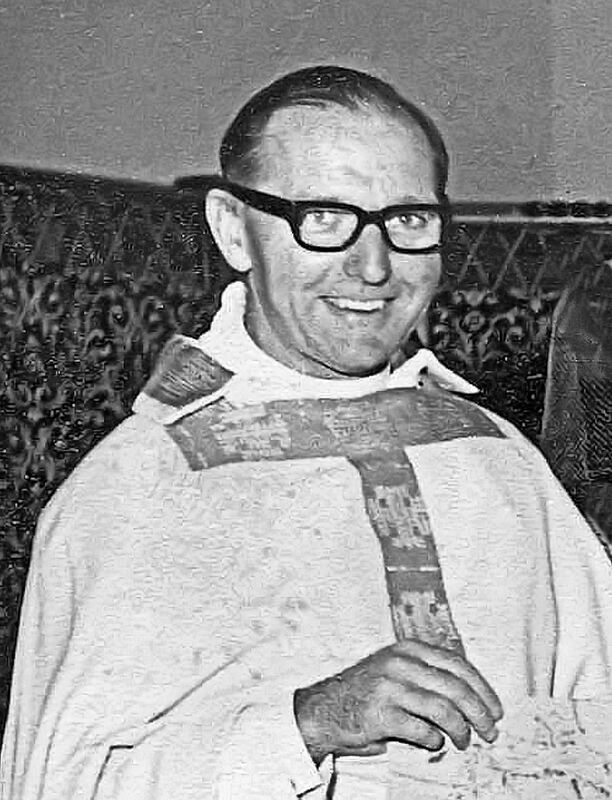 In April 1971 Father Terence Tanner of St Paul’s Church, Maison Dieu Road, was transferred to the smallest parish in the diocese at Goudhurst. No reason was given and it was met with considerable opposition. In June he left Dover following a failed appeal to Rome and was formerly seconded to work in drug rehabilitation in London. 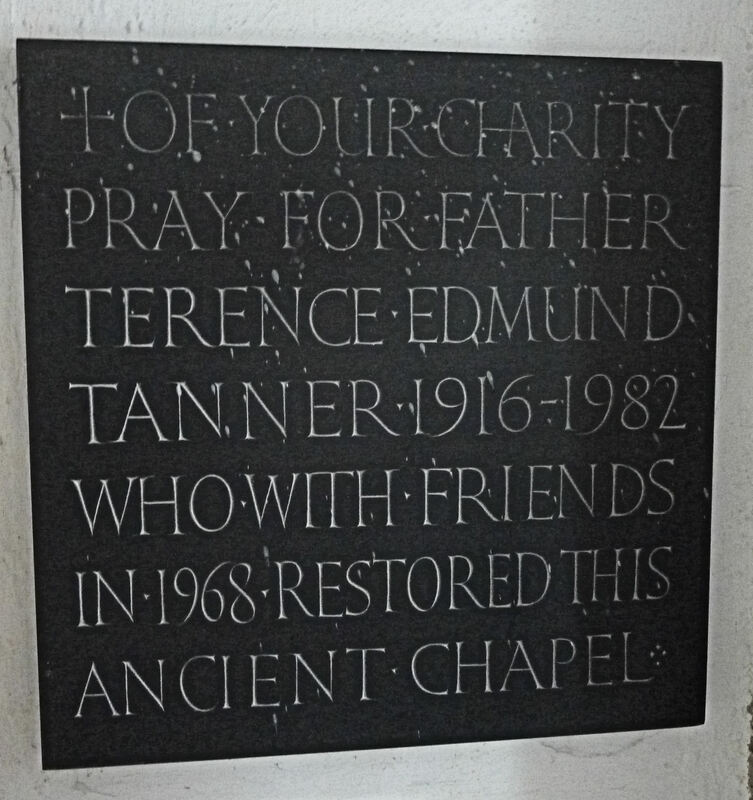 Father Tanner, who saved St Edmund’s Chapel, died in Leominster in 1982. St. Edmund’s Ecumenical Chapel – accepts all faiths and denominations. It is the smallest church in England that is still used for services. 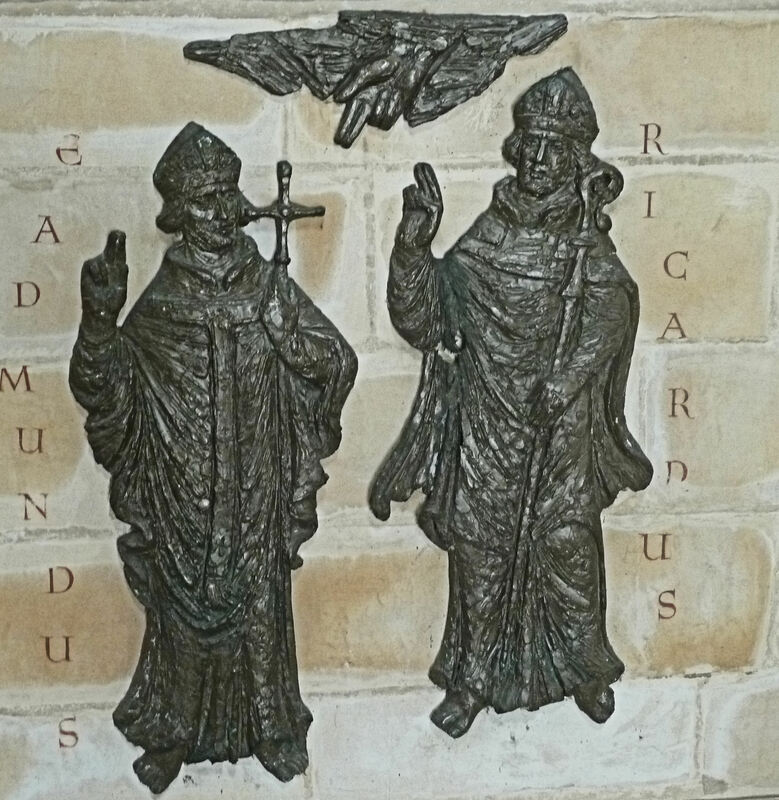 This entry was posted in Religion & Churches, St Edmunds Chapel – dedicated by one Saint to another Saint, St Edmunds Chapel – dedicated by one Saint to another Saint, Tourism. Bookmark the permalink.